Alphabet letter identification is an essential skill to develop in preschool. Kids will engage in so much learning when they practice identifying and matching the eggs onto the correct matching letter with these free mats. These fun Spring themed alphabet printables are just the perfect addition to any preschool classroom or homeschool. The kids will enjoy hunting for the ‘alphabet eggs’ and matching the letters onto their mats. 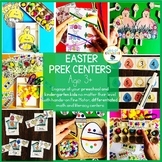 Looking for some more hands-on Easter themed activities for preschool and kindergarten? These fine motor centers and activities will help engage all students! You can play these activities in many different ways. Head on over to TOTSCHOOLING HERE to download your copy of these printables. Click on the image or HERE to go to the post to download this activity.